The Muppets Band! - A fantastic mix of Kermit green, Gonzo Blue, ANIMAL!!! 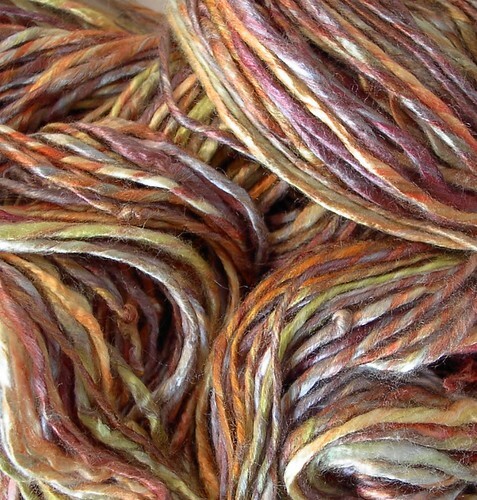 Pink, Fozzie Orange, Dr. Bunsen Honeydew yellow-green, plied with with Ms. Piggy Pink thread! 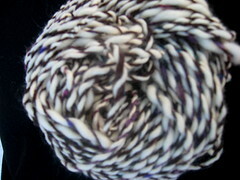 Spun from wool mill ends. Approximately 85 yards. The colors are kind of stale in this pic. Was storming all day. Here is my favourite by far! I call it Clouds in my Coffee on a Winter Morning. the muppets are coming home with me!!!! I wonder what the muppets want to be? whisp3rd.. I LOVE your muppets yarn!! and clouds and coffee!! I want to eat it!!! Here are a few I've made over the past few days.. I'm still figuring out how to use my new wheel. yes.. I did say my new wheel. My mom told me that I could take the Clemes and Clemes home with me!!!! Aaahhh!!!! Sadly the drum carder does not fit in my suitcase... but... she said she will mail it to me. Did I mention my mom is AWESOME? Anyhow.. on to the yarn!! Last but not least is Man Tweed. Heh... I wanted to make a nice manly yarn so could make some hand mitts for my boyfriend... He's pretty drab colorwise, so I made this black.. but with specks of white and red... to make it tweedy. It's about 175 yards. i have to apologize for my pictures.. my parents have a horrible camera.. and.. i'm in Alaska and there is seriously no daylight.. so.. flash photography for all! I love how the second picture of stained glass is sitting next to the window... like it's looking out the window wanting to go outside and play! I love the muppets and stained glass yarns. So pretty. I have two yarns this week. The first was a Christmas present for a friend. I call it Low Tide. 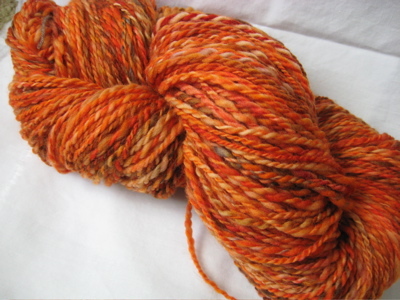 It's about 160 yards of an Alpaca/Tencel blend, dyed by me, and plied with some fuzzy white thread. 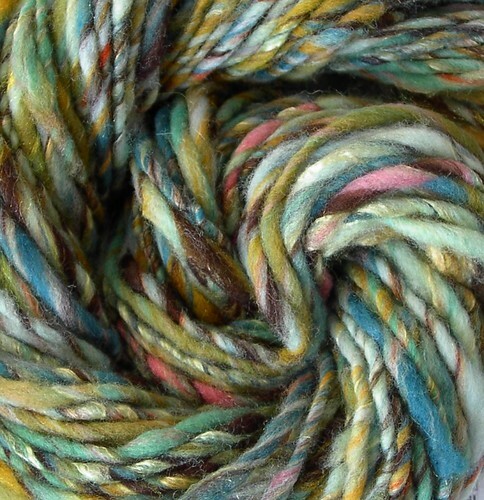 And then there's this crazy multicolor skein that I did for a swap. 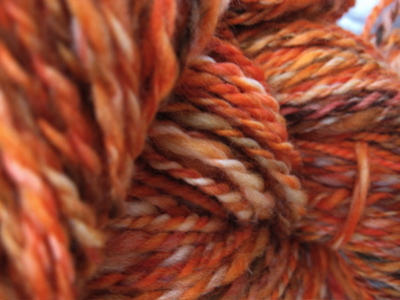 I can't remember the yardage on this one, but it was about 6.5 oz of merino, worsted, 2 ply. Oooh! I like the clouds in my coffee, stained glass (that pic of it by the window is excellent - like itscute said, it looks like it's staring longingly outside! 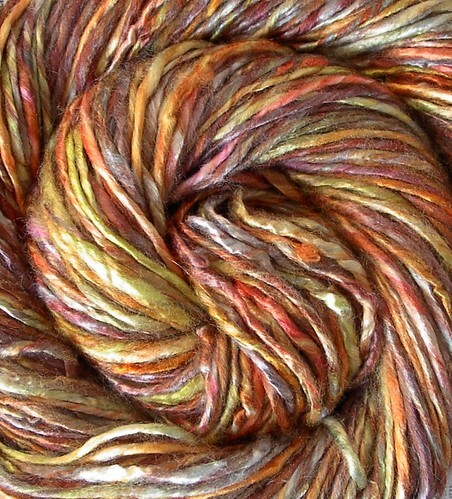 ), and inle_rah's multicolor skein. Bonny - shiny-soft bamboo in shades of brown, yellow, pink, orange, charteuse, and I think a few glimpses of blue. 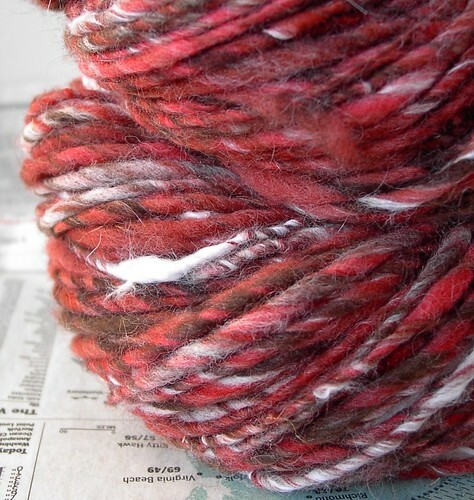 Foxy - Rich red & brown chemical-free falkland wool, plus a few handfuls of soft soft white angora bunny fluff. Unmentionable - Inspired by vintage underthings! 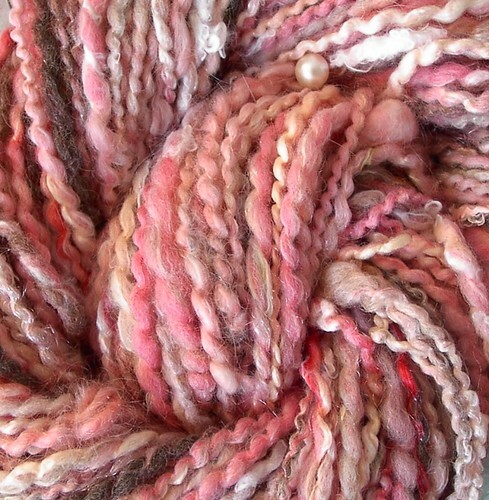 Wool, soysilk, bamboo, angora bunny fluff, and ecospun, plied with invisible thread and pearly buttons. 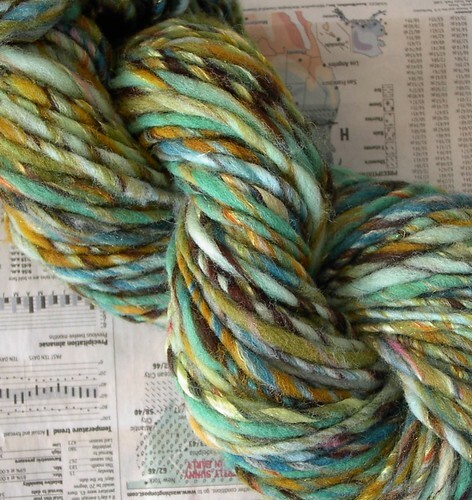 Seascape - Chemical- free falkland wool + bits of shiny lime green bamboo. 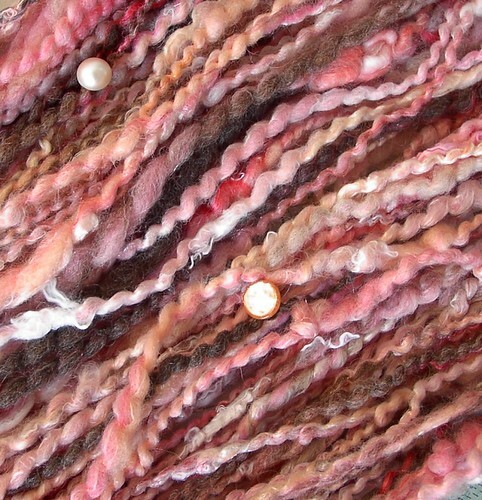 I added in some pinches of pink and orange wool for contrast - I love the colors in this one! It's approximately 247 yards/225 meters, 100 grams. 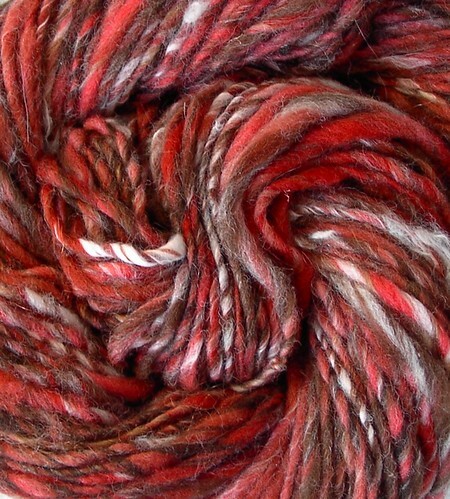 Superwash Merino from Spinknit Yarns & Fibers. The colourway is: "Bob"
The roving was handpainted in oranges and reds with black, blue and browns thrown and a good portion of whitespace. I'm really happy with how it turned out. Waiting anxiously for it to dry after setting the twist... new mittens!! My favorite yarn so far is subloke's Bob! It's pretty drab outside this time of year in Alaska and I love that shot of color. 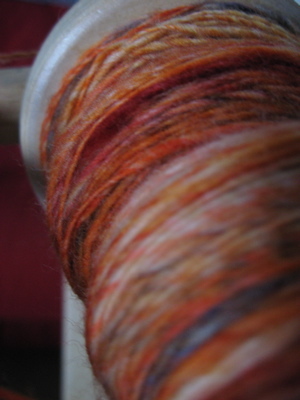 I spun this one for the photo spin-along It's 86 yards. This one is my favorite. 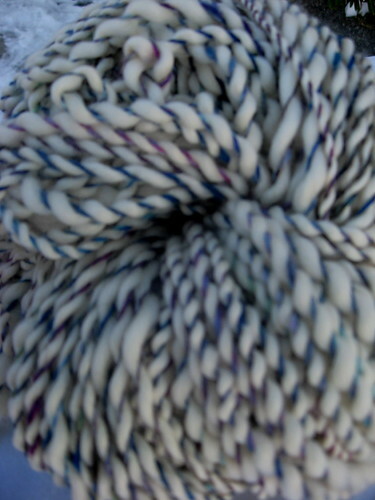 Funfetti is 86 yards of merino plied with purple and blue silk. It's soooooo soft! Feral- How was spinning ecospun? I love to try new fibers. Subloke: I LOVE your Bob yarn. It's so fiery! FeralFeminine: I love the uniformity of colors in Seascape, but when you look closer there are a rainbow of colors! And I love your inspiration for Unmentionables.